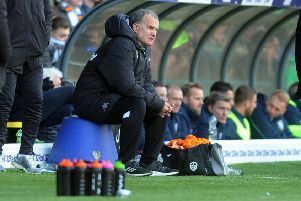 An injury-time goal by Atdhe Nuhiu condemned Leeds United to yet another defeat as they went down 2-1 to Sheffield Wednesday at a snowy Elland Road. In a game played in blizzard conditions at times, United looked to have earned a point with Jay Roy Grot’s first goal for the club, but fell to a sucker punch just as they were pushing for a late winner. The Whites deserved better than their fate as they created plenty of chances despite the difficult conditions, but a lack of confidence in front of goal let them down as they showed again why they have only once in 2018. It was Wednesday who had the first opportunity with Lucas Joao playing Adam Reach in only for home keeper Bailey Peacock-Farrell to save with his feet. United settled and Adam Forshaw’s shot was deflected wide after the visitors were caught out by a short corner. George Boyd saw a 25-yard shot tipped wide by Peacock-Farrell before Leeds should have gone in front with a brilliantly worked free-kick between Pablo Hernandez and Forshaw put Caleb Ekuban clean through. The striker’s tentative effort, was saved, however, by Owls keeper Joe Wildsmith. Ezgjan Alioski, who had a much improved game, was next to be put through after good work by Ekuban and Hernandez, but his effort was deflected wide. A minute later Ekuban was well placed in the box only to hit a wild effort over the bar when he had more time than he realised. Wednesday finished the first half better as Nuhiu’s shot was comfortably saved by Peacock- Farrell and Daniel Pudil put the ball in the net only to be ruled offside. The second half began with the pitch covered in snow after a storm during the break and United seemed to adapt better to the conditions. Alioski hit a shot over from the edge of the box and Ekuban miskicked close to goal after meeting a low cross by Alioski. Joey Pelupessey fired wide from outside the box for the Owls before Hernandez hit a 20-yard free-kick wide for the hosts. Nuhiu’s impressive shot from distance had Peacock-Farrell scrambling before hitting the top of the net, but Wednesday were breathing a sigh of relief when Alioski was sent tumbling in the area with no penalty forthcoming. Gaetano Berardi got forward from full-back to hit an angled shot just wide and it was somewhat against the run of play when Wednesday took the lead in the 71st minute. Reach got on the end of a right wing cross to head the ball against the crossbar and the rebound fell invitingly for Nuhiu to score. Leeds’ response was good for a change with Hernandez sent clean through by Alioski only to see his angled shot saved by Wildsmith. Forshaw went on a strong run to the edge of the box, but his shot went well wide. A goal did finally come in the 86th minute when Grot headed home from close range after meeting Hernandez’s cross. It looked like they would go on and win as Pontus Jansson sent a header over from a free-kick. But just after the board went up for six minutes of added time it was Wednesday who pinched the points as Nuhiu latched onto a long ball forward and proved too strong for Matthew Pennington before converting his one-on-one chance with Peacock-Farrell. Still United could have got a point as they were handed a last minute free-kick on the edge of the box, but their day was summed up when Lasogga sent his shot just wide with everyone holding their breath. Leeds head coach Paul Heckingbottom admitted to being disappointed that his side had not won. He said: “I sound like a broken record at the minute. I should have been highlighting where we’ve done well and won the game, but I’m not. “Both their goals we should have stopped. You’ve got to be clinical at both ends. “The goals were not down to a lack of effort, but we made mistakes. “The last two games we’ve been chasing, you need to be in front. You have to take your chances. If you go behind it makes it really difficult. “We all know why are not winning matches, we are not putting our chances away and making errors at the back. Leeds: Peacock-Farrell, Berardi, Jansson, Pennington, Pearce (Grot 77), Forshaw, O’Kane (Phillips 78), Alioski, Hernandez, Dallas, Ekuban (Lasogga 69). Wednesday: Wildsmith, Venancio, Lees, Pudil, Hunt, Hutchinson (Bannan 66), Pelupessey (Fox 90+6), Reach, Boyd, Joao, Nuhiu.